Need a sign repaired, serviced or upgraded? We are anxious to help! Complete the form below to have one of our helpful staff members assist you. At Phillips Signs and Lighting Inc. We also offer repair services for all signs including those installed by other companies and commercial outdoor signs. Our team of licensed and trained electricians can diagnose, troubleshoot and provide the best solution for your signs. Common service calls we handle have to do with the signs being too dim, damaged for being exposed to the elements, or in need of upgrades. Our team of experts can help you fix any issues your sign might be experiencing. We will get your sign working in no time! 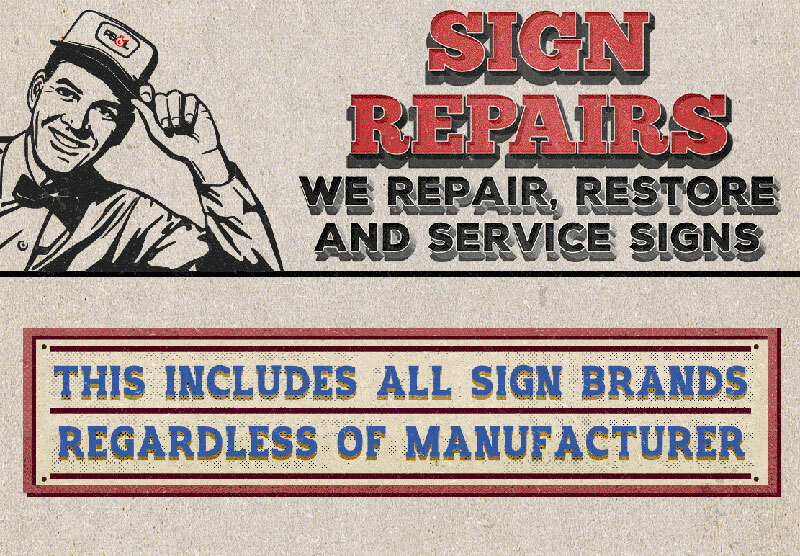 We restore signs using high quality parts and craftsmanship. Restoration is often a more economical way of improving the way your business looks. MAKE YOUR SIGN GREAT AGAIN!! !